What could be better on a Saturday morning? Learn more about what makes St. Louis a great city! Explore the fascinating history, culture and architectural legacy of Downtown St. Louis from the city's founding through its current development. Your experienced guides will discuss famous landmarks as well as hidden gems, stunning architectural details and the art of historic preservation. We have two regularly-scheduled tours on Saturday at 10 am from April 1 to October 31. Check out the details below for the Downtown East and Downtown West tours. We also offer special tours of Grand Center and Washington Avenue and we can create a special tour specifically for your group. Check out the Special Tours page for more details. Special tours are available for groups of five or more. All tours are $10 per person. Children under 12 are free. Tours run between 2 and 2 1/2 hour long and cover about two miles at a leisurely pace. The 2019 tour season starts April 1, but we can do special tours for groups outside the regular Summer season. If you are interested in setting one up, check out our Special Tours Page. 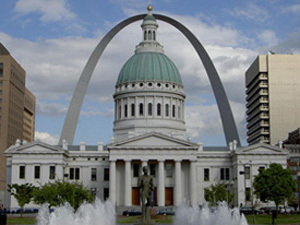 And, e-certificate for Landmarks Downtown St. Louis Walking tours make great gifts year-round. They are perfect for history, and architecture buffs, folks that love St. Louis, or the ones that just like to go for a nice walk on a Saturday morning. Explore the architectural legacy of the heart of the City. From the bustling riverfront of the French-American entrepreneurs to the skyscrapers of the 20th century, you'll find famous architectural and engineering marvels. The east tour starts on the east-side steps of the Old Courtouse at 11 N 4th St, St. Louis, MO 63102. St. Louis' grandest public buildings are a testament to the city's ambitions during the late 19th and early 20th centuries. Explore their history, architectural significance and how they changed the area from blighted to monumental. 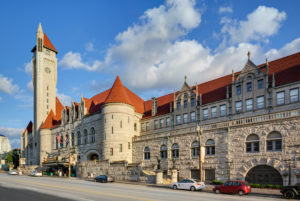 The West tour starts at the main entrance of Union Station at 1820 Market Street, St. Louis, MO 63103. The Downtown Architectural Walking Tours are a program of Landmarks Association of St. Louis the primary advocate for the St. Louis region’s built environment.